This verse was one of my children’s favorite to memorize, mainly because of the video. A lot of children have difficulties at nighttime so it was comforting for my children and they wanted to watch it multiple times. And as a result, they learned the verse very easily. The video comes again from Steve Green. 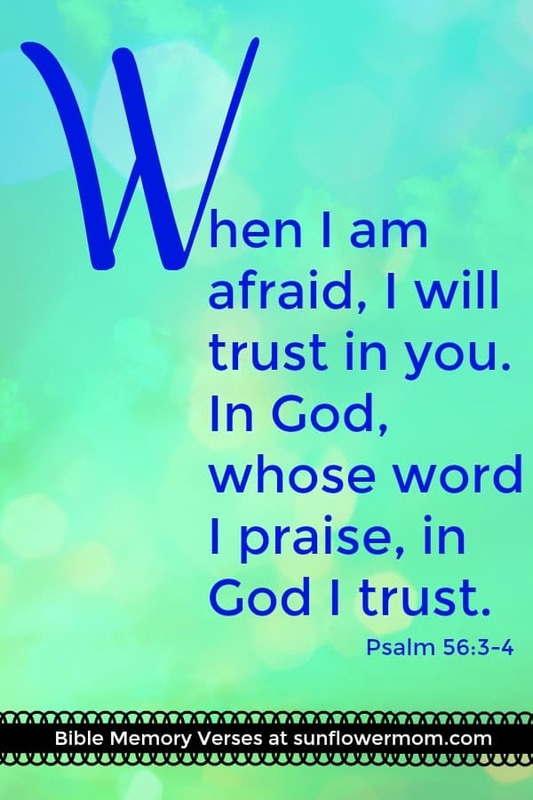 Click on the picture below for my free resource library of a print-friendly version of Psalm 56:3-4 then hang it next to your child’s bed. Every night before bedtime rehearse the verse to the tune above. After about a week, you should both have it memorized. Don’t worry if it takes longer! Did you just find us? This is a whole series of Bible verses aimed at helping your child memorize one Bible verse for each letter of the alphabet. My children did this using these same videos so this is tried and true! For the full index and to start at the beginning, click here! Since we are almost near the end of the 26 scripture series, consider this workbook. It will allow your children to continue memorizing these 26 verses in fun way. Take one page per verse (letter) each night at bedtime. Want scriptures sent directly to your email only for you? We have a 6-week series that includes Bible verses specifically for those who are hurting. It will include a new Bible journal each week along with a screensaver of the Bible verse of the week and a weekly worship video for inspiration. Click here to get started today!